Angers was home to me for three years, so I tend to talk about it a lot. It is also home to some really cool products, and these are things you are probably already familiar with, and some you are not. This will run as a series, as each item has a great story. I will start with the Anjou pear. Angers is part of the Anjou region, and back in the times of Dukes and Duchesses, the Duke of Angers ruled over his Duchy, the region of Anjou. The Musée des Beaux-Art (Fine Art Museum) in Angers has a really cool permanent exhibit highlighting some of its patrimony. There have been people living there along the Maine river since 400,000 B.C. (That is not a typo!) and there have been burial grounds and Neolithic remains found along the river and in excavations. This is all featured in the exhibition, and alongside it, a little case full of examples of pears. Pears are originally from China, but pear trees were brought into Europe through the Silk Road, and eventually entered Rome, where they became a staple. By the mid 1800s, there were over 900 different types of pears in France alone, and the region of Anjou had a school dedicated to fruit tree gardens and the growing of fruit trees. Pears were categorized by how white the interior was, how juicy it is, softness, the perfection of the skin, and how grainy they were. An expert at this time declared only 30 of the varieties “good pears” and 100 of the pears were acceptable for cooking or decoration. Although there were many varieties, the main variety at this point in time was Comice pears. 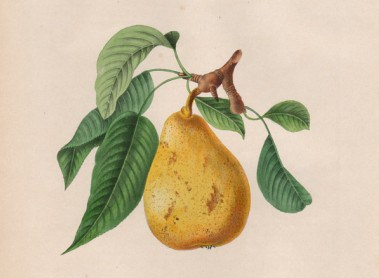 There was even a group of Comice growers who shared which varieties produced the best fruit, and in 1861 there was 65,050 kilograms of Pears shipped out of the Angers train station. That is a lot of pears. It was around this time that the Pear d’Anjou arrived. The name d’Anjou is actually a misnomer, as it originated in Belgium, by a man named Jean-Baptiste Van Mons. After cultivating this type of Comice, he attempted to name it after his head gardener, Pierre Meuris, Nec de Meuris, or the Best of Meuris. Regardless, this variety also came to Anjou around the same time the group of pear growers decided to adopt an umbrella term of d’Anjou for all their pears, regardless of variety, for they were already well-known for their quality. It is because of this mark, that when export came to the United States, we simply called them d’Anjou pears. Some pears are only good enough to cook. There are over 2000 different types of pears, and the Poire d’Anjou is part of a variety known as Beurré, or buttery. A perfectly ripened pear does resemble butter in how easily you can cut it with a knife. What is interesting is that beurré closely resembles a modern slang word in French, bouré, for drunk. I immediately thought of the English expression, when one has had a bit to drink, and they are called ripe. “He’s stumbling all over the place, he sure is ripe!” Well I wasn’t right, but I wasn’t completely wrong. There are two suspected explanations behind bourré, one relating to butter, and the other to ink. Printers in the mid 19th century called the ink they used to print papers, butter, or beurre. When the paper was printed with too much ink, they would call it too buttery, beurré. Thus, when a printer had too much to drink, his friends would call him buttery. Of course, pronouncing such a word with the slur of alcohol over time, will allow for the current spelling bourré. The other history is attributed to the famous Breton-French cookie maker, Lefèvre-Utile, or LU. When their amazingly buttery biscuits came out with too much butter, they would be referred to as beurré. If you happen to find yourself in the mood for a buttery night, I recommend Poire-Williams liquor. You can spend the night letting your friends try to figure out how exactly they get the pear inside the jar. I would wait until they have had a few drinks. Then you can blow their minds when you reveal, they actually let the pear grow inside the glass by attaching it to the trees.